313-315 N. Frances St. in Madison on Monday, March 3, 2014. 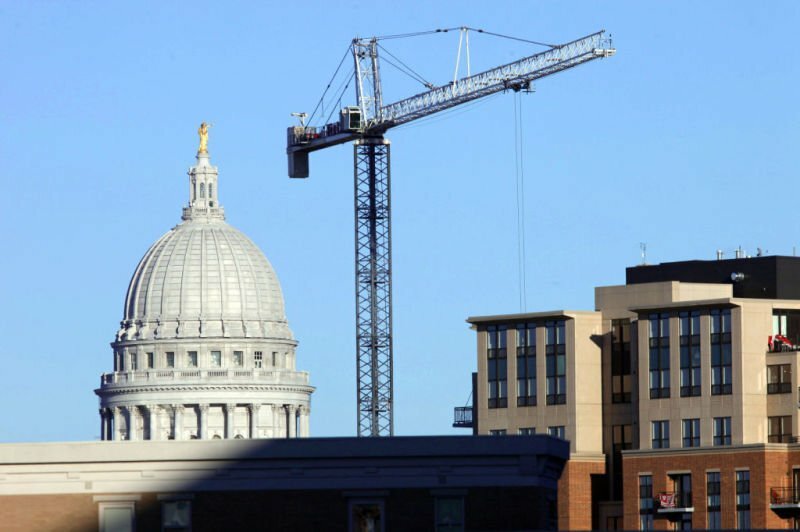 The view of the Capitol with nearby construction cranes in downtown Madison. Boom town: There's no end in sight to new, upscale apartments downtown, but how much is too much? When Marcus Higgins relocated from South Carolina to become vice president of sales at EatStreet, the local online restaurant ordering start-up, one of the first challenges was finding housing with his wife and young daughter. Higgins knew he wanted to live within walking distance of the EatStreet offices, which are located above Paisan’s Restaurant at 131 W. Wilson St. He also liked the idea of being near a vibrant dining scene, farmers markets, museums and other downtown attractions. Finding a suitable apartment wasn’t easy, however. “Honestly, we spent two weeks looking for a decent three-bedroom place downtown and couldn’t find anything,” said Higgins, 29, who eventually found an available two-bedroom in the Lake Park Apartments on Weset Wilson Street. A Minnesota native with an MBA from UW-Milwaukee, Higgins is the kind of tenant driving the flurry of new apartments catering not just to the city’s endless stream of university students but a generation of younger people with good jobs and disposable income who appear to be in no hurry to buy a home. Whether working at Epic Systems in Verona or somewhere else, the chance to live in a thriving but manageable urban area is drawing hundreds of new residents to the downtown. And it’s not just millennials snapping up the shiny units with stainless appliances and balconies, either; empty-nesters, people looking for second homes and suburbanites seeking a lifestyle change are also renting the new apartments. The market appears wide and deep. But all the apartment buildings, while a boon for the local construction industry and downtown nightspots, is also causing some hand-wringing over how many new units the city can absorb and the impact on the price of housing, not to mention overall density. Some real estate insiders and lenders are wondering whether Madison might be getting ahead of itself in the number of new luxury units. At the same time, affordable housing advocates are raising red flags about soaring rents as older buildings are razed to make way for new construction. “It’s a little bit scary,” admits Scott Faust of Boardwalk Investments. Faust counts more than 25 years in local real estate and like a lot of self-made developers, got his start buying and fixing up older apartments. Last year, Faust and his partners broke ground on City View, a slender $6.5 million, 12-story, 42-unit student apartment building adjacent to Dotty Dumpling’s Dowry on North Frances Street. It’s with a certain amount of trepidation that Faust watches the construction continue, including the 329 units with 996 total bedrooms at The Hub at Madison on the 500 block of State Street, just a block from City View. “You look around at all the new stuff that has gone up and some of these places don’t have many lights on,” says Faust. Consider that of the $347 million worth of new development in the city of Madison last year, nearly two-thirds, some $223 million, are apartment projects. Most, though not all, are in the central city and many include structured parking and some kind of commercial use on the lower floors. 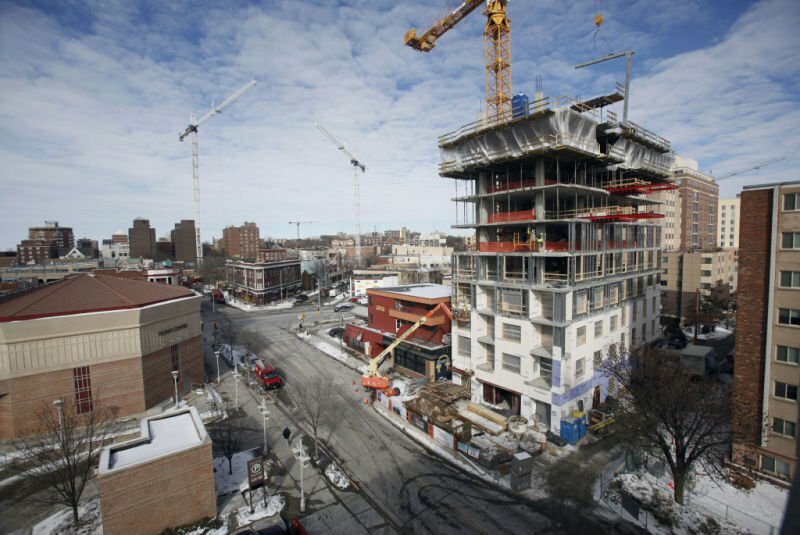 In the “core downtown” — the area roughly between Blair Street and Park Street — Madison saw 396 new apartment units added in 2013, with an additional 1,440 either approved or under construction, according to city figures. On two adjacent blocks on West Johnson Street, for example, work is underway on a pair of massive projects: the $40 million, 319-unit Johnson Dayton apartments from David Schutz and the $60 million, 14-story, 255-unit Ovation 309 from Hovde Properties. “Looking at it from the outside, it seems like there are an awful lot of expensive apartments going up all at once and frankly I don’t know how people can afford them,” says Dave Ohnstad, a retired Madison appraiser and small landlord who manages 10 units in three buildings. But if the city is in danger of any kind of new apartment overreach, it hasn’t shown up yet in the vacancy rates. Figures compiled by Madison Gas & Electric based on its billing records put the area’s overall vacancy rate at a historically low 2.3 percent. In the 53703 zip code, the heart of downtown, the vacancy rate in the fourth quarter of 2013 was 1.34 percent, with just 153 vacant units out of 11,400 available. Susan Schmitz, president of Downtown Madison Inc., says the demand in the central city remains strong for a variety of reasons, including Epic and its 6,000 employees. She doesn’t see any repeat of the condominium overbuild of the last decade. Schmitz is particularly pleased to see the lower floor commercial spaces in the new buildings attracting business tenants. Leasing those spaces in the mixed-use buildings favored by city planners today has proven a challenge in some locations, although the Constellation on East Washington Avenue has attracted a Cargo Coffee shop, the Star Bar and a new restaurant, still in the planning stages, from L’Etoile and Graze chef Tory Miller. Craig Enzenroth of the Gallina Companies — which recently opened the 57-unit Ideal Apartments on South Park Street and is now building the 74-unit Vicinato at 1022 Mound St. — thinks there is plenty of air left in the bubble. He notes that most apartment deals are structured around an assumed 3 to 5 percent vacancy rate. “We’ve been running above 98.5 percent (occupancy) at our properties here in Dane County for the last three years so there is still a ways to go,” he says. The Ideal, which came on the market in December, has managed to rent out 40 of the 57 units despite the bitter winter weather and poor timing; about 25 percent of the tenants are Epic employees. Its 5,000 square feet of commercial space is still vacant but owners are negotiating with a restaurant tenant. Most developers aim for a summer opening to take advantage of the traditional Aug. 15 leasing schedule driven by the student population. So how many new apartments can Madison handle? Michael Thorson, managing director of Inventure Capital, has figures showing the city proper could absorb some 4,500 new apartment units over the next five years. That includes about 1,800 units just to meet a current undersupply, coupled with anticipated population growth and a generational shift away from home ownership. “Madison has everything a big city can offer but on a smaller scale — except downtown apartments,” says Thorson, who is teaming with developer Lance McGrath on a proposed 14-story apartment at 149 E. Wilson St. that has faced dogged opposition from neighbors in the adjacent Marina Condominiums over added traffic, sidewalk congestion and loss of views. Thorson maintains that millennials, roughly the 18 to 35 age bracket, want flexibility in their lifestyle and aren’t looking to get locked into a mortgage. Certainly the interest in downtown apartment living isn’t confined to Madison. Richard Green, a former UW-Madison real estate professor now teaching at the University of Southern California, sees a combination of career-switching younger people looking for a car-free lifestyle coupled with baby boomers looking to downsize after retirement. He calls it the “golden age” for apartments and says it has been going on all across the country. Green says downtown Madison with its many attributes is just beginning to realize its potential as an attractive place after college. Sunny O’Brien, 53, is paying $2,600 a month for a fashionable two-bedroom with Capitol views and underground parking at Seven27, the quirky five-story off of Monona Bay near the Findorff Construction headquarters. The building from Urban Land Interests features amenities like an indoor bike repair facility, professional grade fitness center and a dog washing station. But the upscaling comes with a price: higher rents and more density. For the McGrath proposal at 149 W. Wilson, for example, rents in the new building would range from $1,000 for a small studio apartment to more than $3,000 per month for a three-bedroom unit. At the Ideal Apartments, built on the site of the iconic Ideal Body Shop, rents go from $980 for a studio and $1,300 for a one-bedroom apartment up to $2,100 for a two-bedroom with a view of Monona Bay. Affordable housing advocates like Dane County Board Supervisor Heidi Wegleitner are calling the gentrification of America’s downtowns “white infill” as lower-income people are pushed farther out onto the urban fringes away from jobs and services. In San Francisco, where tensions over housing costs are legendary, the median monthly rent has jumped 27 percent to $3,475 since 2011, according to a recent report in Time magazine, forcing out long-term residents. Many are pointing the finger at technology workers, leading to protests against “Google buses” — private services that shuttle workers to and from Silicon Valley, about an hour outside of the city. There’s been no backlash here against Epic workers making the reverse commute but Wegleitner says the rush to build luxury apartments in downtown Madison has done little to address the shortage of housing in the broader community. “We do need to create more units overall but you can’t just leave it up to where developers will get rich building expensive units,” says Wegleitner. To that end, a new draft report from the city’s Housing Strategy Committee has found that as rents rise and vacancy rates fall, even moderate-income households are being priced out of Madison’s rental market. The report says that nearly half of Madison renters are now considered “housing cost burdened,” meaning they are paying more than 30 percent of their monthly income to their landlord. “I suppose if you end up with this huge glut of luxury apartments it might theoretically drive rents down but I don’t see any indication that is happening,” says Wegleitner. What may eventually happen in Madison, says Joseph Long of Waterstone Mortgage, is that renters may realize they can come out better financially if they take the plunge and buy a home or condo. “My hunch is that renters who are paying $1,200 a month or up for an apartment will get sick of it quickly and become homeowners,” he said. If so, it could put a dent in demand for new apartments in Madison. Already in Chicago, developers are scrambling to attract tenants to upscale new buildings with extras like in-building dog-walking services, big screen TV party rooms and fitness centers with steam rooms and golf simulators. Some analysts there are now warning that things got too hot too fast, especially in the high-end apartment market where rents for a downtown studio generally start at $2,000. “Demand is not keeping up with supply that is already being delivered,” Ron DeVries, a vice president at Appraisal Research Counselors, told the Chicago Tribune recently. DeVries noted that even though vacancy rates are increasing, another 2,300 units are being added this year and another 4,000 are planned for 2015. Back in Madison, Tom DeChant, a member of the city Urban Design Commission, has watched the panel approve 1,500 new units in the past 18 months and can’t help but wonder where it ends. “I haven’t heard anyone else express this concern about overbuilding — it’s just something rattling around in my own head,” he says. Still, city planning unit director Katherine Cornwell says public officials aren’t in the business of telling private sector developers how many homes or apartments to build. “We plan for growth and calibrate our zoning to accommodate it, and the market responds,” she says. Cornwell says the challenge is to ensure that development happens in strategic locations across the city to take advantage of transit corridors and existing infrastructure, like the large shopping centers. Assuming that all of the $347 million in new development projects in Madison last year are added to the property tax rolls, it would deliver some $6.9 million in revenue annually back to the city. For her part, new arrival O’Brien thinks Madison is doing it the right way. The Madison metropolitan statistical area saw 15.8 percent growth in construction jobs between June 2012 and June 2013. McGrath is looking to convert a metal building into usable space as part of a 76-unit project.